What Is the Historically Challenged, Rule-Worshipping John Taylor Talking About? A couple of weeks ago, I wrote a post chiding John Taylor for his habitual verbal carelessness. As if that were not enough, Taylor, in a recent talk at the IMF, appearing on a panel on monetary policy with former Fed Chairman Ben Bernanke and the former head of the South African central bank, Gill Marcus, extends his trail of errors into new terrain: historical misstatement. Tony Yates and Paul Krugman have already subjected Taylor’s talk to well-deserved criticism for its conceptual confusion, but I want to focus on the outright historical errors Taylor blithely makes in his talk, a talk noteworthy, apart from its conceptual confusion and historical misstatements, for the incessant repetition of the meaningless epithet “rules-based,” as if he were a latter-day Homeric rhapsodist incanting a sacred text. Taylor starts by offering his own “mini history of monetary policy in the United States” since the late 1960s. When I first started doing monetary economics . . ., monetary policy was highly discretionary and interventionist. It went from boom to bust and back again, repeatedly falling behind the curve, and then over-reacting. The Fed had lofty goals but no consistent strategy. If you measure macroeconomic performance as I do by both price stability and output stability, the results were terrible. Unemployment and inflation both rose. What Taylor means by “interventionist,” other than establishing that he is against it, is not clear. Nor is the meaning of “bust” in this context. The recession of 1970 was perhaps the mildest of the entire post-World War II era, and the 1974-75 recession was certainly severe, but it was largely the result of a supply shock and politically imposed wage and price controls exacerbated by monetary tightening. (See my post about 1970s stagflation.) Taylor talks about the Fed’s lofty goals, but doesn’t say what they were. In fact in the 1970s, the Fed was disclaiming responsibility for inflation, and Arthur Burns, a supposedly conservative Republican economist, appointed by Nixon to be Fed Chairman, actually promoted what was then called an “incomes policy,” thereby enabling and facilitating Nixon’s infamous wage-and-price controls. The Fed’s job was to keep aggregate demand high, and, in the widely held view at the time, it was up to the politicians to keep business and labor from getting too greedy and causing inflation. Then in the early 1980s policy changed. It became more focused, more systematic, more rules-based, and it stayed that way through the 1990s and into the start of this century. Yes, in the early 1980s, policy did change, and it did become more focused, and for a short time – about a year and a half – it did become more rules-based. (I have no idea what “systematic” means in this context.) And the result was the sharpest and longest post-World War II downturn until the Little Depression. Policy changed, because, under Volcker, the Fed took ownership of inflation. It became more rules-based, because, under Volcker, the Fed attempted to follow a modified sort of Monetarist rule, seeking to keep the growth of the monetary aggregates within a pre-determined target range. I have explained in my book and in previous posts (e.g., here and here) why the attempt to follow a Monetarist rule was bound to fail and why the attempt would have perverse feedback effects, but others, notably Charles Goodhart (discoverer of Goodhart’s Law), had identified the problem even before the Fed adopted its misguided policy. The recovery did not begin until the summer of 1982 after the Fed announced that it would allow the monetary aggregates to grow faster than the Fed’s targets. So the success of the Fed monetary policy under Volcker can properly be attributed to a) to the Fed’s taking ownership of inflation and b) to its decision to abandon the rules-based policy urged on it by Milton Friedman and his Monetarist acolytes like Alan Meltzer whom Taylor now cites approvingly for supporting rules-based policies. The only monetary policy rule that the Fed ever adopted under Volcker having been scrapped prior to the beginning of the recovery from the 1981-82 recession, the notion that the Great Moderation was ushered in by the Fed’s adoption of a “rules-based” policy is a total misrepresentation. But Taylor is not done. Few complained about spillovers or beggar-thy-neighbor policies during the Great Moderation. The developed economies were effectively operating in what I call a nearly international cooperative equilibrium. Really! Has Professor Taylor, who served as Under Secretary of the Treasury for International Affairs ever heard of the Plaza and the Louvre Accords? 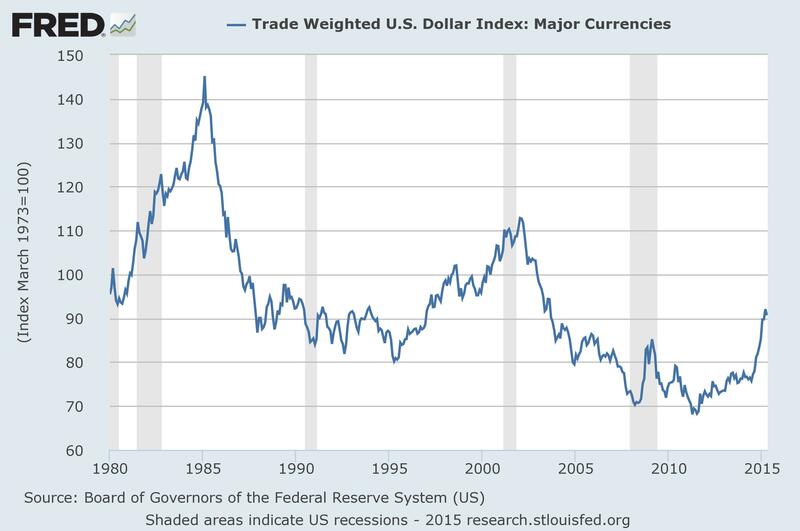 The chart below shows the fluctuation in the trade weighted value of the US dollar against the other major trading currencies since 1980. Does it look like there was a nearly international cooperative equilibrium in the 1980s? But then there was a setback. The Fed decided to hold the interest rate very low during 2003-2005, thereby deviating from the rules-based policy that worked well during the Great Moderation. You do not need policy rules to see the change: With the inflation rate around 2%, the federal funds rate was only 1% in 2003, compared with 5.5% in 1997 when the inflation rate was also about 2%. Well, in 1997 the expansion was six years old and the unemployment rate was under 5% and falling. In 2003, the expansion was barely under way and unemployment was rising above 6%. I could provide other dubious historical characterizations that Taylor makes in his talk, but I will just mention a few others relating to the Volcker episode. Some argue that the historical evidence in favor of rules is simply correlation not causation. But this ignores the crucial timing of events: in each case, the changes in policy occurred before the changes in performance, clear evidence for causality. The decisions taken by Paul Volcker came before the Great Moderation. Yes, and as I pointed out above, inflation came down when Volcker and the Fed took ownership of the inflation, and were willing to tolerate or inflict sufficient pain on the real economy to convince the public that the Fed was serious about bringing the rate of inflation down to a rate of roughly 4%. But the recovery and the Great Moderation did not begin until the Fed renounced the only rule that it had ever adopted, namely targeting the rate of growth of the monetary aggregates. The Fed, under Volcker, never even adopted an explicit inflation target, much less a specific rule for setting the Federal Funds rate. The Taylor rule was just an ex post rationalization of what the Fed had done by instinct. Another point relates to the zero bound. Wasn’t that the reason that the central banks had to deviate from rules in recent years? Well it was certainly not a reason in 2003-2005 and it is not a reason now, because the zero bound is not binding. It appears that there was a short period in 2009 when zero was clearly binding. But the zero bound is not a new thing in economics research. Policy rule design research took that into account long ago. The default was to move to a stable money growth regime not to massive asset purchases. OMG! Is Taylor’s preferred rule at the zero lower bound the stable money growth rule that Volcker tried, but failed, to implement in 1981-82? Is that the lesson that Taylor wants us to learn from the Volcker era? Some argue that rules based policy for the instruments is not needed if you have goals for the inflation rate or other variables. They say that all you really need for effective policy making is a goal, such as an inflation target and an employment target. The rest of policymaking is doing whatever the policymakers think needs to be done with the policy instruments. You do not need to articulate or describe a strategy, a decision rule, or a contingency plan for the instruments. If you want to hold the interest rate well below the rule-based strategy that worked well during the Great Moderation, as the Fed did in 2003-2005, then it’s ok as long as you can justify it at the moment in terms of the goal. This approach has been called “constrained discretion” by Ben Bernanke, and it may be constraining discretion in some sense, but it is not inducing or encouraging a rule as a “rules versus discretion” dichotomy might suggest. Simply having a specific numerical goal or objective is not a rule for the instruments of policy; it is not a strategy; it ends up being all tactics. I think the evidence shows that relying solely on constrained discretion has not worked for monetary policy. Taylor wants a rule for the instruments of policy. Well, although Taylor will not admit it, a rule for the instruments of policy is precisely what Volcker tried to implement in 1981-82 when he was trying — and failing — to target the monetary aggregates, thereby driving the economy into a rapidly deepening recession, before escaping from the positive-feedback loop in which he and the economy were trapped by scrapping his monetary growth targets. Since 2009, Taylor has been calling for the Fed to raise the currently targeted instrument, the Fed Funds rate, even though inflation has been below the Fed’s 2% target almost continuously for the past three years. Not only does Taylor want to target the instrument of policy, he wants the instrument target to preempt the policy target. If that is not all tactics and no strategy, I don’t know what is. Since beginning this series of posts about accounting identities and their role in the simple Keynesian model, I have received a lot of comments from various commenters, but none has been more persistent, penetrating, and patient in his criticisms than JKH, and I have to say that he has forced me to think very carefully, more carefully than I had ever done before, about my objections to forcing the basic Keynesian model to conform to the standard national income accounting identities. So, although we have not (yet?) reached common ground about how to understand the simple Keynesian model, I can say that my own understanding of how the model works (or doesn’t) is clearer than it was when the series started, so I am grateful to JKH for engaging me in this discussion, even though it has gone on a lot longer than I expected, or really wanted, it to. In response to my previous post in the series, JKH offered a lengthy critical response. Finding his response difficult to understand and confusing, I wrote a rejoinder that prompted JKH to write a series of further comments. Being preoccupied with a couple of other posts and life in general, I was unable to respond to JKH until now. Given the delay in my response, I decided to respond to JKH in a separate post. I start with JKH’s explanation of how an increase in investment spending is accounted for. First, the investment injection creates income that accrues to the factors of production – labor and capital. This works through cost accounting. The price at which the investment good is sold covers all costs – including the cost of capital. That said, the price may not cover the theoretical “hurdle rate” for the cost of capital. But that is a technical detail. The equity holders earn some sort of actual residual return, positive or negative. So in the more general sense, the actual cost of capital is accounted for. So the investment injection creates an equivalent amount of income. No one says that investment expenditure will not generate an equivalent amount of income; what is questionable is whether the income accrues to factors of production instantaneously. JKH maintains that cost accounting ensures that the accrual is instantaneous, but the recording of a bookkeeping entry is not the same as the receipt of income by households, whose consumption and savings decisions are the key determinant of income adjustments in the Keynesian model. See the tacit assumption in the sentence immediately following. Consider the effect at the moment the income is fully accrued to the factors of production – before anything else happens. I understand this to mean that income accrues to factors of production the instant expenditure is booked by the manufacturer of the investment goods; otherwise, I don’t understand why this occurs “before anything else happens.” In a numerical example, JKH posits an increase in investment spending of 100, which triggers added production of 100. For purposes of this discussion, I stipulate that there is no lag between expenditure and output, but I don’t accept that income must accrue to workers and owners of the firm instantaneously as output occurs. Most workers are paid per unit of time, wages being an hourly rate based on the number of hours credited per pay period, and salaries being a fixed amount per pay period. So there is no immediate and direct relationship between worker input into the production process and the remuneration received. The additional production associated with the added investment expenditure and production may or may not be associated with any additional payments to labor depending on how much slack capacity is available to firms and on how the remuneration of workers employed in producing the investment goods is determined. That amount of income must be saved by the macroeconomy – other things equal. We know this because no new consumer goods or services are produced in this initial standalone scenario of a new investment injection. Therefore, given that saving in the generic sense is income not used to purchase consumer goods and services, this new income created by an assumed investment injection must be saved in the first instance. Since it is quite conceivable (especially if there is unused capacity available to the firm) that producing new investment goods will not change the total remuneration received by (or owed to) workers in the current period, all additional revenue collected by the firm accruing entirely to the owners of the firm, revenue that might not be included in the next scheduled dividend payment by the firm to shareholders, I am not persuaded that it is unreasonable to assume that there is a lag between expenditure on goods and services and the accrual of income to factors of production. At any rate, whether the firm’s revenue is instantaneously transmuted into household income does not seem to be a question that can be answered in only one way. What the macroeconomy “must” do is an interesting question, but in the basic Keynesian model, income is earned by households, and it is households, not an abstraction called the macroeconomy, that decide how much to consume and how much to save out of their income. So, in the Keynesian model, regardless of the accounting identities, the relevant saving activity – the saving activity specified by the marginal propensity to save — is the saving of households. That doesn’t mean that the model cannot be extended or reconstructed to allow for saving to be carried out by business firms or by other entities, but that is not how the model, at its most basic level, is set up. So at this incipient stage before the multiplier process starts, S equals I. That’s before the marginal propensity to consume or save is in motion. One’s eyes may roll at this point, since the operation of the MPC includes the complementary MPS, and the MPS is a saving function that also operates as the multiplier iterates with successive waves of income creation and consumption. I understand these two sentences to be an implicit concession that the basic Keynesian model is not being presented in the way it is normally presented in textbooks, a concession that accords with my view that the basic Keynesian model does not always dovetail with the national income identities. Lipsey and I say: don’t impose the accounting identities on the Keynesian model when they are at odds; JKH says reconfigure the basic Keynesian model so that it is consistent with the accounting identities. Where JKH and I may perhaps agree is that the standard textbook story about the adjustment process following a change in spending parameters, in which unintended inventory accumulation corresponding to the frustration of individual plans plays a central role, does not follow from the basic Keynesian model. So one may ask – how can these apparently opposing ideas be reconciled – the contention that S equals I at a point when the multiplier saving dynamic hasn’t even started? The investment injection results in an equivalent quantity of income and saving as described earlier. I think you question this off the top while I have claimed it must be the case. But please suspend disbelief for purposes of what I want to describe next, because given that assumed starting point, this should at least reinforce the idea that S = I at all times following that same assumption for the investment injection. It must be the case, if you define income and expenditure to be identical. If you define them so that they are not identical, which seems both possible and reasonable, then savings and investment are also not identical. So now assume that the first round of the multiplier math works and there is an initial consumption burst of quantity 66, representing the MPC effect on the income of 100 that was just newly created. And correspondingly there is new saving of 33. A pertinent question then is how this gets reflected in income accounting. As a simplification, assume that the factors of the investment good production who received the new income of 100 are the ones who spend the 66. So the economy has earned 100 in its factors of investment good production capacity and has now spent 66 in its MPC capacity. Recall that at the investment injection stage considered on its own, before the multiplier starts to work, the economy saved 100. Yes, that’s fine if income does accrue simultaneously with expenditure, but that depends on how one chooses to define and measure income, and I don’t feel obligated to adopt the standard accounting definition under all circumstances. (And is it really the case that only one way of defining income is countenanced by accountants?) At any rate, in my first iteration of the lagged model, I specified the lag so that income was earned by households at the end of the period with consumption becoming a function of income in the preceding period. In that setup, the accounting identities were indeed satisfied. However, even with the lag specified that way, the main features of the adjustment process stressed in textbook treatments – frustrated plans, and involuntary inventory accumulation or decumulation – were absent. Then, in the first stage of the multiplier, the economy spent 66 on consumption. For simplicity of exposition, I’ve assumed those who initially saved were the ones who then spent (I.e. the factors of investment production) But no more income has been assumed to be earned by them. So they have dissaved 66 in the second stage. At the same time, those who produced the 66 of consumer goods have earned 66 as factors of production for those consumer goods. But the consumer goods they produced have been purchased. So there are no remaining consumer goods for them to purchase with their income of 66. And that means they have saved 66. Therefore, the net saving result of the first round of the multiplier effect is 0. Thus an MPS of 1/3 has resulted in 0 incremental saving for the macroeconomy. That is because the opening saving of 100 by the factors of production for the investment good has only been redistributed as cumulative saving as between 33 for the investment good production factors and 66 for the consumer good production factors. So the amount of cumulative S still equals the amount of original S, which equals I. And the important observation is that the entire quantity of saving was created originally and at the outset as equivalent to the income earned by the factors of the investment good production. There is no logical problem here given the definitional imputation of income to households in the initial period before any payments to households have actually been made. However, the model has to be reinterpreted so that household consumption and savings decisions are a function of income earned in the previous period. Each successive round of the multiplier features a similar combination of equal dissaving and saving. The result is that cumulative saving remains constant at 100 from the outset and I = S remains in tact always. The important point is that an original investment injection associated with a Keynesian multiplier process accounts for all the macroeconomic saving to come out of that process, and the MPS fallout of the MPC sequence accounts for none of it. That is fine, but to get that result, you have to amend the basic Keynesian model or make consumption a function the previous period’s income, which is consistent with what I showed in my first iteration of the lagged model. But that iteration also showed that savings has a somewhat different meaning from the meaning usually attached to the term, saving or dissaving corresponding to a passive accumulation of funds associated with income exceeding or falling short of what it was expected to be in a given period. JKH followed up this comment with another one explaining how, within the basic Keynesian model, a change in investment (or in some other expenditure parameter) causes a sequence of adjustments from the old equilibrium to a new equilibrium. Assume the economy is at an alleged equilibrium point – at the intersection of a planned expenditure line with the 45 degree line. Suppose planned investment falls by 100. Again, assume MPC = 2/3. The scenario is one in which investment will be 100 lower than its previous level (bearing in mind we are referring to the level of investment flows here). Using comparable logic as in my previous comment, that means that both I and S drop by 100 at the outset. There is that much less investment injected and saving created as a result of the economy not operating at a counterfactual level of activity equal to its previous pace. So expenditure drops by 100 – and that considered just on its own can be represented by a direct vertical drop from the previous equilibrium point down to the planning line. But as I have said before, such a point is unrealizable in fact, because it lies off the 45 degree line. And that corresponds to the fact that I of 100 generates S of 100 (or in this case a decline in I from previous levels means a decline in S from previous levels). So what happens is that instead of landing on that 100 vertical drop down point, the economy combines (in measured effect) that move with a second move horizontally to the left, where it lands on the 45 degree line at a point where both E and Y have declined by 100. This simply reflects the fact that I = S at all times as described in my previous comment (which again I realize is a contentious supposition for purposes of the broader discussion). Actually, it is clear that being off the 45-degree line is not a matter of possibility in any causal or behavioral sense, but is simply a matter of how income and expenditure are defined. With income and expenditure suitably defined, income need not equal expenditure. As just shown, if one wants to define income and expenditure so that they are equal at all times, a temporal adjustment process can be derived if current consumption is made a function of income in the previous period (presumably with an implicit behavioral assumption that households expect to earn the same income in the current period that they earned in the previous period). The adjustment can be easily portrayed in the familiar Keynesian cross, provided that the lag is incorporated into the diagram by measuring E(t) on the vertical axis and measures Y(t-1) on the horizontal axis. The 45-degree line then represents the equilibrium condition that E(t) = Y(t-1), which implies (given the implicit behavioral assumption) that actual income equals expected income or that income is unchanged period to period. Obviously, in this setup, the economy can be off the 45-degree line. Following a change in investment, an adjustment process moves from the old expenditure line to the new one continuing in stepwise fashion from the new expenditure line to the 45-degree line and back in successive periods converging on the point of intersection between the new expenditure line and the 45-degree line. This happens in steps representable by discrete accounting. Common sense suggests that a “plan” can consist of a series of such discrete steps – in which case there is a ratcheting of reduced investment injections down the 45 degree line – or a plan can consist of a single discrete step depending on the scale or on the preference for stepwise analysis. The single discrete step is the clearest way to analyse the accounting record for the economics. There is no such “plan” in the model, because no one foresees where the adjustment is leading; households assume in each period that their income will be what it was in the previous period, and firms produce exactly what consumers demand without change in inventories. However, all expenditure planned at the beginning of each period is executed (every household remaining on its planned expenditure curve), but households wind up earning less than expected in each period. Suitably amended, I consider this statement to be consistent with Lipsey’s critique of standard textbook expositions of the Keynesian cross adjustment process wherein the adjustment to a new equilibrium is driven by the frustration of plans. Finally, some brief responses to JKH’s comments on handling lags. I’m going to refer to standard accounting for Y as Y and the methodology used in the post as LGY (i.e. “Lipsey – Glasner income” ). Standard accounting recognizes income in the time period in which it is earned. LGY accounting recognizes income in the time period in which it is paid in cash. Consider the point in table 1 where the MPC propensity factor drops from .9 to .8. . . . In the first iteration, E is 900 ( 100 I + 800 C ) but LGY is 1000. Household saving is shown to be 200. First, a real world example. Suppose a US corporation listed on a stock exchange reports its financial results at the end of each calendar quarter. And suppose it pays its employees once a month. But for each month’s work it pays them at the start of the next month. Then there is no way that this corporation would report it’s December 31 financial results without showing a liability on its balance sheet for the employee compensation earned in December but not yet paid by December 31. . . . In effect, the employees have loaned the corporation one months salary until that loan is repaid in the next accounting period. The corporation will properly list a liability on its balance sheet for wages not yet paid. This may be a “loan in effect,” but employees don’t receive an IOU for the unpaid wages because the wages are not yet due. I am no tax expert, but I am guessing that a liability to pay taxes on the wages owed to, but not yet received by, employees is incurred until the wages are paid, notwithstanding whatever liability is recorded on the books of the corporation. A worker employed in 2014, but not paid until 2015, will owe taxes on his 2015, not 2014, tax return. A “loan in effect” is not the same as an actual payment. This is precisely what is happening at the macro level in the LGY lag example. So the standard national income accounting would show E = Y = 900, with a business liability of 900 at the end of the period. Households would have a corresponding financial asset of 900. The “financial asset” in question is a fiction. There is a claim, but the claim at the end of the period has not fallen due, so it represents a claim to an expected future payment. I expect to get a royalty check next month, for copies of my book sold last year. I don’t consider that I have received income until the check arrives from my publisher, regardless of how the publisher chooses to record its liability to me on its books. And I will not pay any tax on books sold in 2014 until 2016 when I file my 2015 tax return. And I certainly did not consider the expected royalties as income last year when the books were sold. In fact, I don’t know — and never will — when in 2014 the books were sold. Back at the beginning of that same period, business repaid the prior period liability of 1000 to households. But they received cash revenue of 900 during the period. So as the post says, business cash would have declined by 100 during the period. This component of 100 when received by households is part of a loan repayment in effect. This does not constitute a component of standard income accounting Y or S for households. This sort of thing is captured In flow of funds accounting. Just as LGY is the delayed payment of Y earned in the previous period, LGS overstates S by the difference between LGY and Y. For example, when E is 900, LGY is 1000 and Y is 900. LGS is 200 while S is 100. So under regular accounting, this systematic LG overstatement reflects the cash repayment of a loan – not the differential receipt of income and saving. That is certainly a possible interpretation of the assumptions being made, but obviously there are alternative interpretations that are completely consistent with workings of the basic Keynesian model. And another way of describing this is that households earn Y of 900 and get paid in the same period in the form of a non-cash financial asset of 900, which is in effect a loan to business for the amount of cash that business owes to households for the income the latter have already earned. That loan is repaid in the next period. Again, I observe that “payments in effect” are being created to avoid working with and measuring actual payments as they take place. I have no problem with such “payments in effect,” but that does not mean that the the magnitudes of interest can be measured in only one way. There are several ironies in the comparison of LG accounting with standard accounting. First, using standard accounting in no way impedes the analysis of cash flow lags. In fact, this is the reason for separate balance sheet and flow of funds accounting – so as not to conflate cash flow analysis with the earning of income when there are clear separations between the earning of income and the cash payments to the recipients of that income. The 3 part framework is precise in its treatment of such situations. Not sure where the irony is. In any event, I don’t see how the 3 part framework adds anything to our understanding of the Keynesian model. Second, in the scenario constructed for the post, there is no logical connection between a delayed income payment of 1000 and a decision to ramp down consumption propensity. Why would one choose to consume less because an income payment is systematically late? If that was the case, one would ramp down consumption every time a payment was delayed. But every such payment is delayed in this model. Changes in consumption propensity cannot logically be a systematic function of a systematic lag – or consumption propensity would systematically approach 0, which is obviously nonsensical. This seems to be a misunderstanding of what I wrote. I never suggested that the lag between expenditure and income is connected (logically or otherwise) to the reduction in the marginal propensity to consume. A lag is necessary for there to be a sequential rather than an instantaneous adjustment process to a parameter change in the model, such as a reduced marginal propensity to consume. There is no other connection. Third, my earlier example of a corporation that delayed an income payment from December until January is a stretch on reality. Corporations have no valid reason to play such cash management games that span accounting periods. They must account for legitimate liabilities that are outstanding when proceeding to the next accounting period. I never suggested that corporations are playing a game. Wage payments, royalty and dividend payments are made according to fixed schedules, which may not coincide with the relevant time period for measuring economic activity. Fiscal years and calendar years do not always coincide. Shorter term intra period lags may still exist – as within a one month income payment cycle. But again, so what? There cannot be systemic behavior to reduce consumption propensity due to systematic lags. Moreover, a lot of people get paid every 2 weeks. But that is not even the relevant point. Standard accounting handles any of these issues even at the level of internal management accounting accruals between external financial reporting dates. I never suggested that the propensity to consume is related to the lag structure in the model. The propensity to consume determines the equilibrium; the lag structure determines the sequence of adjustments, following a change in a spending parameter, from one equilibrium to another. PS I apologize for this excessively long — even by my long-winded and verbose standards — post. John Taylor, tireless self-promoter of “rules-based monetary policy” (whatever that means), inventor of the legendary Taylor Rule, and very likely the next Chairman of the Federal Reserve Board if a Republican is elected President of the United States in 2016, has a history of verbal faux pas, which I have been documenting not very conscientiously for almost three years now. In his teaser, Professor Taylor invoked Hayek’s Road to Serfdom and his Constitution of Liberty to explain the importance of the rule of law and its relationship to personal freedom. Certainly Hayek had a great deal to say and a lot of wisdom to impart on the subjects of the rule of law and personal freedom, but Professor Taylor, though the winner of the Hayek Prize, was obviously not interested enough to read Hayek’s chapter on monetary policy in The Constitution of Liberty; if he had he could not possibly have made the following assertions. Stripped of all technicalities, this means that government in all its actions is bound by rules fixed and announced beforehand—rules which make it possible to foresee with fair certainty how the authority will use its coercive powers in given circumstances and to plan one’s individual affairs on the basis of this knowledge. . . .
[T]he case against discretion in monetary policy is not quite the same as that against discretion in the use of the coercive powers of government. Even if the control of money is in the hands of a monopoly, its exercise does not necessarily involve coercion of private individuals. The argument against discretion in monetary policy rests on the view that monetary policy and its effects should be as predictable as possible. The validity of the argument depends, therefore, on whether we can devise an automatic mechanism which will make the effective supply of money change in a more predictable and less disturbing manner than will any discretionary measures likely to be adopted. The answer is not certain. Taylor, while of course praising Hayek at length, simply displayed an appalling ignorance of Hayek’s writings and an inability to comprehend, or a carelessness so egregious that he was unable to properly read, the title — yes, the title! — of a pamphlet written by Hayek in the 1970s, when inflation was reaching the double digits in the US and much of Europe. The pamphlet, entitled Full Employment at any Price?, was an argument that the pursuit of full employment as an absolute goal, with no concern for price stability, would inevitably lead to accelerating inflation. The title was chosen to convey the idea that the pursuit of full employment was not without costs and that a temporary gain in employment at the cost of higher inflation might well not be worth it. Professor Taylor, however, could not even read the title correctly, construing the title as prescriptive, and — astonishingly — presuming that Hayek was advocating the exact policy that the pamphlet was written to confute. Perhaps Professor Taylor was led to this mind-boggling misinterpretation by a letter from Milton Friedman, cited by Taylor, complaining about Hayek’s criticism in the pamphlet in question of Friedman’s dumb 3-perceent rule, to which criticism Friedman responded in his letter to Hayek. But Professor Taylor, unable to understand what Hayek and Friedman were arguing about, bewilderingly assumed that Friedman was criticizing Hayek’s advocacy of increasing the rate of inflation to whatever level was needed to ensure full employment, culminating in this ridiculous piece of misplaced condescension. And all of this wisdom was delivered by Professor Taylor in his Hayek Lecture upon being awarded the Hayek Prize. Well done, Professor Taylor, well done. Practical experience and empirical studies show that checklist-free medical care is wrought with dangers just as rules-free monetary policy is,” Mr. Taylor wrote in a recent defense of his proposal. Obviously, what Professor Taylor meant to say is that medical care is “fraught” (rhymes with “wrought”) with dangers, but some people just can’t be bothered with pesky little details like that, any more than winners of the Hayek Prize can be bothered with actually reading the works of Hayek to which they refer in their Hayek Lecture. Let’s just hope that if Professor Taylor’s ambition to become Fed Chairman is realized, he’ll be a little bit more attentive to, say, the position of decimal points than he is to the placement of question marks and to the difference in meaning between words that sound almost alike. PS I see that the Manhattan Institute has chosen James Grant as the winner of the 2015 Hayek Prize for his book America’s Forgotten Depression. I’m sure that 2015 Hayek Lecture will be far more finely wrought grammatically and stylistically than the 2012 Hayek Lecture, but, judging from book for which the prize was awarded, I am not overly optimistic that it will make a great deal more sense than the 2012 Hayek Lecture, but that is not a very high bar to clear.